The Coronation ceremony for a Queen can be whatever you want it to be. If a chapter starts off small, the Coronation can be done after the chapter has grown. Perhaps done on the 1st anniversary of the chapter or other such special occasion. The Coronation can be combined with the “Red Sash Ceremony” as well. The following are some ideas for Coronation Ceremonies collected from various sources. Procession – much like a wedding ceremony, you could have someone sprinkle rose petals, red & purple confetti or glitter, someone holding a cushion with the crown on top etc. The chapter members may be part of the procession (Either walking before or after their Queen) taking their places on either side of the throne or in a circle for the rest of the ceremony. 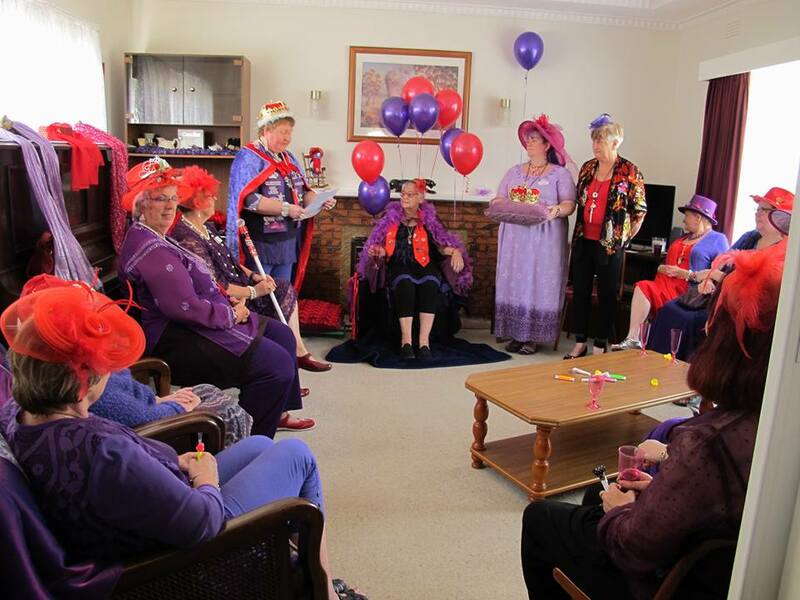 The Queen shall sit upon a “Throne” – Which can be a special throne or a chair decorated with purple/red fabrics. Crown – this is often brought out on a cushion then placed on the Queen’s head as part of the ceremony to make it official. Scepter – a jeweled stick or other such item, used as a symbol of the Queen as well as being used to tap the member on each shoulder during a naming/red sash ceremony. Gifting the Queen a “Red Hat Survival Kit“. I would like to welcome everyone to the Coronation of our beloved Queen ……<Queen Name>…. Do you hereby swear on your honour, to rule in a kind and benevolent fashion? Do you promise not to hold long and boring business meetings? Will you endeavour not to bring in educational speakers that are boring and just plain dull? Will you always rule with silliness? Do you promise to promote fun, laughter, and comic relief when needed? Will you follow and lead in the tenants from the poem “Warning” and make up for the sobriety of your youth? Will you “pick the flowers in other people’s gardens and learn to spit”? 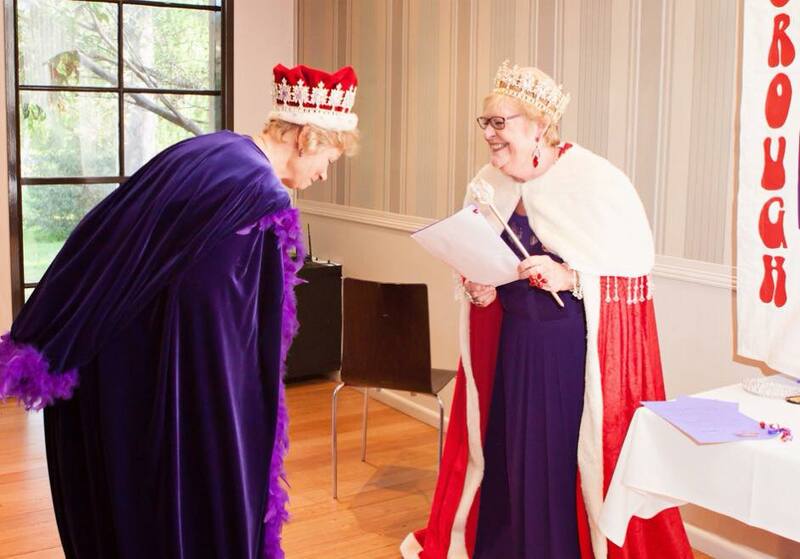 Upon hearing your acceptance of all vows, and on behalf of the ……<Chapter Name>…… Pink and Red Hatters, I officially declare you Queen ….<Queen Name>…… of the …<Chapter Name>…… and I would like to adorn you with your Coronation robe, crown and scepter. May you wear your robe with regality, hold your head high, with pride in your ruby crown, and make wise declarations with your sassy scepter. May you rule with dignity and honour! Long live the Queen! (All say) Long live the Queen!!! I ….<Queen Name>…… do lightheartedly swear on my Red Hat that I will do my best to uphold the Spirit of Red hatting. I will invite you lovely Ladies to teas; get togethers, grand events, and fun outings. I will gussy up as your Reigning Sovereign, setting an example that COMMANDS NOTICE and RESPECT, dispelling the notion that women our age are OLD or inclined to DISAPPEAR. If life is a stage then we will not hide in the wings. We will be front and center kicking up our RED and PURPLE HEELS! As a Red Hatter I promise to wear Full Purple Regalia found in thrift shops, rummage sales and bargain racks. It is the thrill of the hunt that intrigues me. And I promise to encourage the ladies to dig out their gloves and get them on. I promise to set an example for the Red Hat Sisters that aging is a matter of the mind and since they don’t mind it DOESN’T MATTER. I promise to guide THE LADIES-IN-WAITING (Pink Hats) in the ways of Glam, Giggles, and Sisterhood. I promise to discreetly let a Red Hatter know when something sags, bags, or droops, unless there is nothing she can do about it. Then Ignorance is Bliss. I promise that together we will take our silliness seriously and take our seriousness out for a laugh. And I promise to learn to spit and sit on the pavement. Surely someone will come by and help me up again. I will greet middle age with the following mantra: Fun is more fun – after fifty. I will always remember that silliness is the comedy relief of life. I will wear the royal colours of red and purple and whatever else suites me at the time, with pride to every Red Hat Function. I will spread the word to all that will listen: Everything is funny as long as it happens to someone else. I will live the philosophy that women and cats will do as they please, and men and dogs should relax and get used to it! I will loudly deny that a woman my age is OLD, recanting that Forty is the old age of youth, but fifty is the youth of old age! I will welcome all visitors and friends causing happiness wherever I go, not whenever I go. I will learn that life can only be understood backwards, even though it must be lived forwards. I will do my best to solve the human equation by adding love, subtracting hate, multiplying good and dividing between truth and error. I will always consider the postage stamp while I am Queen. It secures success through its ability to stick to one thing until it gets there. I promise not to take life too seriously, knowing that I’ll never get out of it alive. I will realize that everyone is gifted; some just open the package sooner. I promise that confusion will not only reign in this disorganization, it will pour!! !